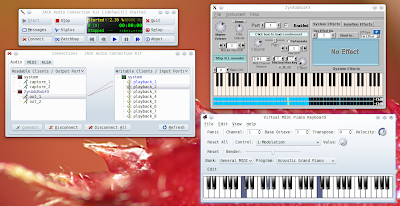 其實主要步驟只要照著 Compdigitec Labs 的這篇 Virtual MIDI Keyboard In Ubuntu 作即可. 不過實際上在我的系統上有些微的不同. 因為對整個 Sound System 不熟悉, 沒有辦法理解是怎麼回事, 姑且記下來當作 "這樣設定也可以" 看吧. 其中 vmpk 是要作為虛擬 MIDI 鍵盤的主介面. 雖然後來發現 ZynAddSubFx 也有虛擬鍵盤介面, 但是變更 Keyboard Map 設定跟其他各種設定上, 感覺 vmpk 比 ZynAddSubFx 來的方便. 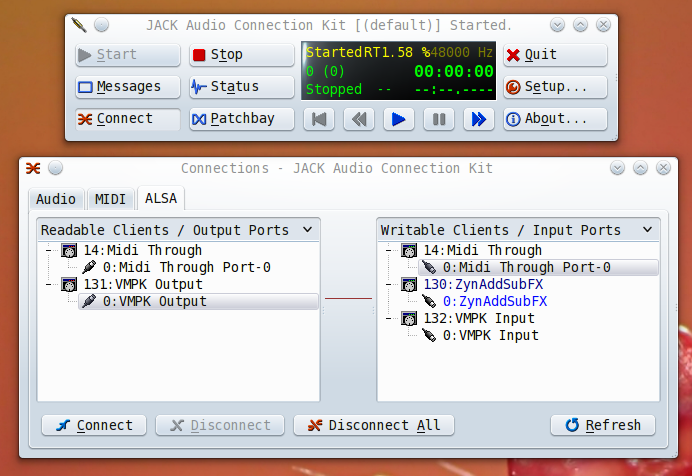 而 qjackctl 是 Connection 控制器, 負責把 vmpk 作為前端介面, 輸出的 MIDI 資料導引到 ZynAddSubFx, 再到實體的音效硬體/音效卡作播出. 因為 vmpk 本身其實就是單純的虛擬鍵盤子系統, 因此到實際播出前需要 Synthesizer 幫忙處理合成. 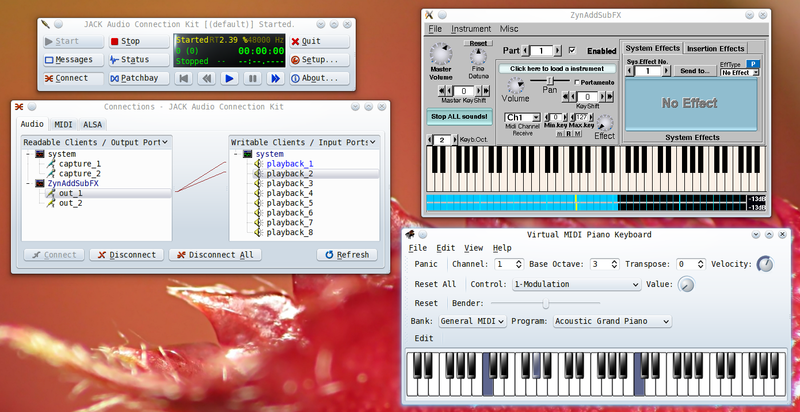 ZynAddSubFx 在這裡就當作 Synthesizer 使用. 啟動沒問題的話, 開啟 ZynaddSubFx 以及 vmpk, 然後利用 Connect 按鈕設定上面說的, 從 vmpk 到 ZynaddSubFx 再到音效裝置的 Connections. 照 Compdigitec Labs 的文章中之示範, 音效卡代號應該會出現在 ALSA 分頁中, 但是我的沒有 ^^b, 所以先只有把 vmpk 的 Output 接到 ZynaddSubFx. 接上的方法很簡單, 用滑鼠把 vmpk Output 拉到 ZynaddSubFx 上放開即可. 而 ZynaddSubFx 到音效裝置間的連結, 則是改在 Audio 頁面中搞定. 其中 playback 1 是左聲道, playback2 是右聲道, 其他的在我系統中無作用. 這樣設定完就 OK 了~, 把視窗 Focus 移到 vmpk 上面, 對應的鍵盤按下去就可以看到琴鍵變化, 以及發出 MIDI 音效. 在 ZynaddSubFx 視窗中也會有對應的變化. 其實當焦點移到 ZynaddSubFx 上也是可以有同樣的反應. 不過如上所述 vmpk 較占優勢的理由, 本篇還是以 vmpk 作為 Front-End 為主. This entry was posted on 下午11:40 and is filed under mandriva , open source . You can follow any responses to this entry through the RSS 2.0 feed. You can leave a response, or trackback from your own site. 請問您是如何開啟Zynth的? 我下載後解壓縮到檔案夾,裡頭只有那個dll,可以請您告訴我要用哪個程式開嗎? 我試過把副檔名改成.exe,結果執行它時,它說這不是正確的Win32應用程式......開啟Jack Connection Kit的時候也常有錯誤出現...它的錯誤訊息是06:55:55.029 Patchbay deactivated. 06:55:55.490 Startup script terminated with exit status=1. 06:55:55.510 JACK was started with PID=18244160. 06:55:55.560 JACK was stopped with exit status=-1. 06:55:56.010 Post-shutdown script terminated with exit status=1. 06:55:57.743 Could not connect to JACK server as client. - Overall operation failed. - Server communication error. Please check the messages window for more info.